From Sylvain Chomet, the brilliant French director whose great 2003 Oscar-nominated hit The Triplets of Belleville raised the bar for animated films throughout the world, comes a true masterpiece of visual enchantment. One of the most original and unique geniuses in cinema today, Mr. Chomet directed, wrote, illustrated and composed the music for this holiday jewel, an homage to the sweet, sad melancholia of the legendary French comic Jacques Tati. Adapted from an old, unproduced screenplay by Tati, The Illusionist follows the heavy-footed adventures of an aging, washed-up magician named Tatischeff, a relic from the old school of vaudeville who is rejuvenated by the affection and companionship of a young chambermaid named Alice. Mr. Chomet's passion for hand-drawn figures gives the film the look of museum-quality watercolors that move. From the Scottish highlands to the bustling traffic jams of Edinburgh, the animation is so three-dimensional that when the illusionist's disagreeable rabbit escapes through the hurling bodies of a trio of robust acrobats, wreaking havoc in the theater, you really feel as though it's heading for your seat. Both natural and incandescent light filters through an elaborately designed department store photographed through plate-glass windows. The most amazing effect of all: Tatischeff (the real surname of Jacques Tati) enters an empty cinema where a tiny audience watches an actual movie clip of Mon Oncle, one of Tati's classics. It has to be seen to be believed. It is such high art that you will never believe you are looking at one canvas at a time. -Rex Reed, New York Observer, 15 December 2010. Revered French film-maker and comic Jacques Tati died, aged 75, in 1982 - the same year that Sylvain Chomet finished high school. And yet there is a love for Tati in the animator's work that transcends their generational differences - and even time itself. Chomet's first short, La Vieille Dame et les pigeons (1998), paid homage to Tati's Playtime (1967) by opening and closing with a chorus of crass American tourists in Paris; his debut feature Les Triplettes de Belleville (2002) featured a poster for Tati's Monsieur Hulot's Holiday (1953) prominent in the apartment of the titular triplets and showed them cackling away at a live-action excerpt from Tati's Jour de fete (1949). Making free use of Tati's trademark combination of nostalgic conservatism and clownish absurdity, Belleville acknowledged its debt to Tati's 'creative spirit' in the end credits. 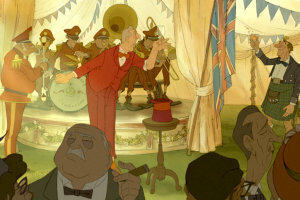 With his second feature The Illusionist, Chomet takes this love further. In a sequence towards the film's end (and set in 1959), a hand-drawn figure who closely resembles Jacques Tati (and who even shares the director's birth name, Tatischeff) ducks into an Edinburgh cinema. In the lobby a poster is clearly visible for Les Triplettes de Belleville - even though this film was not to be made, or even conceived, until some four decades later. Tatischeff then enters the auditorium, where he is confronted with a live-action version of himself, as the real Tati is seen onscreen playing his alter ego Monsieur Hulot in Mon Oncle (1958). Here, cinema is envisaged as a magical hall of mirrors in which Chomet can conjure an impossible dance across time and space between himself, the late director who has been his greatest inspiration, and their own respective filmic personae. If The Illusionist feels like a film Tati might himself have conjured, that's because it is closely adapted from a screenplay Tati himself wrote in the late 1950s, but then shelved for fear of the damage such a weighty piece might do to his carefully cultivated onscreen image. Instead he turned his attention to the less personal, altogether less bleak Hulot vehicle Playtime (1967), which Chomet slyly acknowledges in a scene where Tatischeff is shown holding a restaurant's glass door open for a well-to-do couple, apparently about to reprise one of the most famous slapstick sequences from that film. The routine is interrupted when a voice on the soundtrack is heard to shout "Non, non! ", rejecting the chaotic slapstick of Playtime and pulling Chomet's animation back on to the road not taken by Tati. In fact these two negatives comprise some of the only intelligible words spoken in a film that is, like all of Tati's (and Chomet's) films, virtually free of dialogue - although by no means silent. As in any Tati film, often the funniest comic business unfolds in the background or on the periphery, demanding that close attention be paid to the film's rich visual texture in its panoramic entirety. Chomet has shifted the principal location from Prague to Edinburgh (where The Illusionist was in fact also made, following Chomet's decision, after presenting Les Triplettes de Belleville at the Edinburgh Film Festival, to set up his Django studios in the city). The difference between this and other films by either Tati or Chomet can be measured in its (sometimes oppressively) realist setting, its darkly elegiac tone and an approach to nostalgia that is more bitter than sweet. Tatischeff is an ageing Parisian vaudeville magician in the era of rock'n'roll, always moving from place to place in search of an audience that still appreciates his demode brand of performance. Both in London and ultimately in Edinburgh, he is upstaged by new band Billy Boy and the Britoons; he also has the misfortune to bring his act to an isolated pub on an island off the west coast of Scotland on the very same day that electricity first arrives, so that both he and a local band of traditional musicians are replaced almost overnight by a new jukebox blaring dance music (no doubt also by the Britoons). The light we see switched on in the pub for the first time will be echoed at the film's close, as the light to Tatischeff's Edinburgh room is switched off for the last time, marking the end both of his Scottish tour, and of an era. Our illusionist will not triumph, like Hulot, against encroaching modernity, but resign himself grimly to his own obsolescence, eventually putting all he loves behind him and setting off on the road one more time. His naive ward Alice, meanwhile, will slowly be transformed - in one of Tatischeff's most effective (and least affordable) illusions - from provincial ingenue to elegant lady about town, failing to recognise what she has lost until it is gone. The last gift Tatischeff will grant her is, precisely, her disillusionment, marking both her final coming of age and his own surrender to it. It is an act of betrayal (and self-betrayal) that will leave few dry eyes in the cinema. Tatischeff and Alice are joined in their tragicomic adventures by a hilariously disgruntled stage rabbit, a perpetually drunken Scotsman and a whole troupe of similarly desperate performers (the alcoholic ventriloquist, the suicidal clown - only the younger acrobats display the levity that matches their calling). But the real tritagonist here is time itself. Ever behind the times, Tatischeff is repeatedly delayed from his London stage debut by the extended encores of the trendier act on before him; he struggles to operate newfangled car-washing equipment to a clock's audible tick-tick-ticking; and he fails to be properly woken by his alarm clock in time for a new gig with an advertising firm. Meanwhile Alice, determined to make up for time lost back in her Hebridean home, first meets her future beau in an upmarket Edinburgh store, browsing clocks and watches. 'Out with the old and in with the new' seems to be Chomet's melancholic theme here - a theme that's reinforced visually by the merger of exquisite 'old-fashioned' hand-drawn 2D characters and digitally created 3D props and backgrounds. It looks absolutely beautiful; and while Tatischeff and Alice may both end up disenchanted, Chomet paints in plenty of subtle optical trickery to keep viewers, at least, believing in magic. Wind-blown feathers are mistaken for snow. 'Little' Joe, the owner of the Edinburgh hotel for artistes where Tatischeff and Alice take up residence, turns out not to be seated behind the counter, but just very short. Two headlights rushing out of the darkness at Alice in fact belong not to an oncoming truck, but to a pair of police motorbikes. As a book's pages flutter in the breeze, its shadow on the wall assumes the form of a flapping bird. In this world of fleeting phenomena, Chomet himself proves to be the ultimate illusionist. Charting the shifting relationship between an older man and a younger woman, Tati's original script may also have been a love letter to his daughter Sophie Tatischeff. Four decades after it was written, Sophie mentioned her late father's unproduced script to Chomet when he approached the Tati estate for permission to use an extract from Jour de fete in Belleville. Sophie died before The Illusionist went into production, but the heartfelt letter has at last been delivered, preserving in its images the memory of Tati pere et fille. Magicians may not exist, but Chomet has managed to bring the dead to life. - Anton Bitel, Sight and Sound, September 2010.